After suffering a winter which was about seven months long featuring several large dumps of snow, it seemed like we were never going to get to Spring, but when we got a few good days of weather everything began to come to life again, well almost everything, there were a few fatalities. The result was that everything seemed to be flowering at once, as soon as the snowdrops stopped flowering the tulips began, and normally there would be about four months in between those varieties being in bloom. So below are a few photos that I took of my garden over the last week or so. I’ve been amazed that the harsh winter doesn’t seem to have been a problem for the insect life. I think I’ve already seen more butterflies and bees than I saw all of last summer. 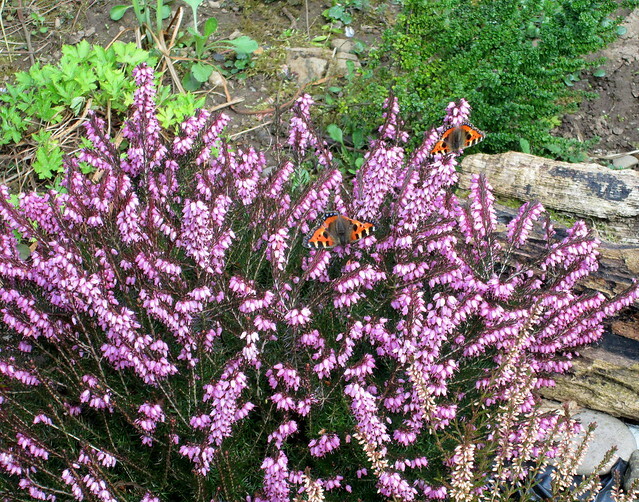 These red admirals (I think that’s what they are anyway) have been enjoying the heather in my garden. The ornamental cherry below is a recent purchase so I can’t claim any of the kudos for its lovely flowers, it’s called Brilliant and is a slow growing one. I’ve put some seeds in the bare ground in the photo, eventually I hope that all of the soil will be covered with plants, apart from anything else that should stop so many weed seeds from germinating! The ‘rockery’ area is filling up quite well. 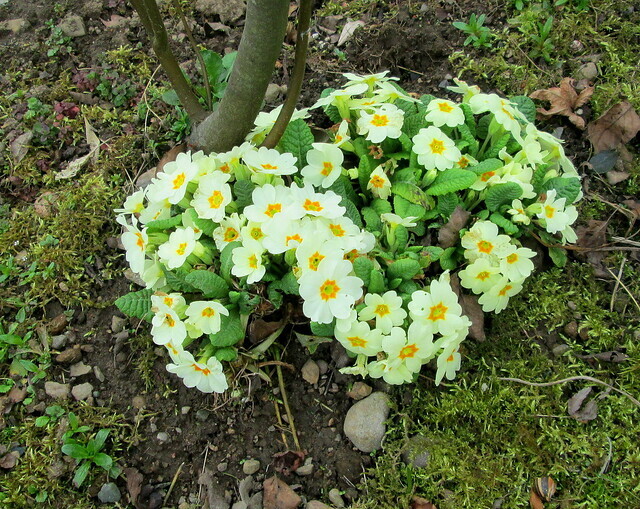 The primulas below are seeding themselves around the place. 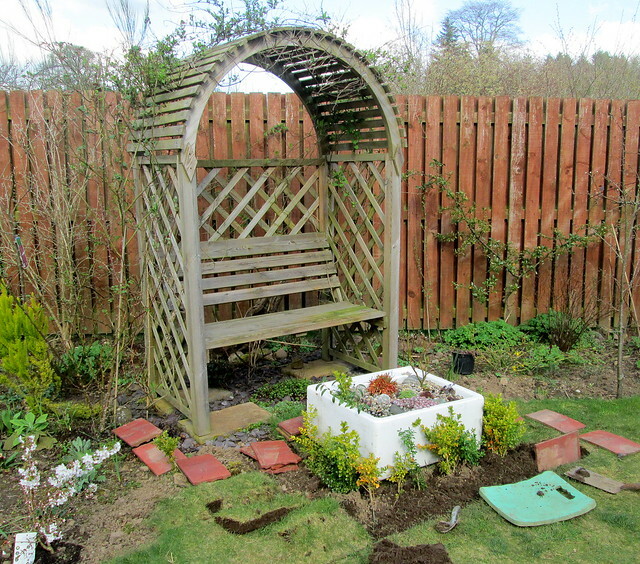 The area around the bench/pergola is still a work in progress, hopefully this will be the last of the grass that I have to dig up, it’s hard work. I’ll do another garden post next week – tulips and quince blossom will feature. This entry was posted in Gardening and tagged cherry blossom, garden in Fife, heather, primulas by Katrina. Bookmark the permalink. Oh, thanks so much for a garden post. I love the red admiral butterflies–gorgeous. 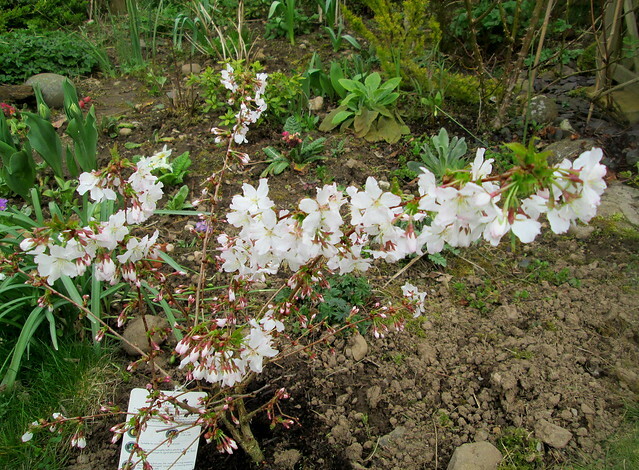 And, of course, your new ornamental cherry–how lovely–a genuine cure for those late-late winter blues we’ve been suffering. I also love your primulas, though I haven’t seen this variety before. I so appreciate your garden photos. I’m wondering if you have a garden of your own, or if you’re too busy to garden at the moment? I’m sure my garden helps keep me sane-ish! The midges here have taken a liking to me, for that reason I decided against a pond although I would have loved to build one but it would have become a midge breeding spa! Your garden is lovely, well worth all the hard work I know you put into it. In our new garden, we have some of those primulas. I always thought they were annuals, and maybe they are in New England, but not here. That’s a lovely cherry. It must be very happy to bloom like that! 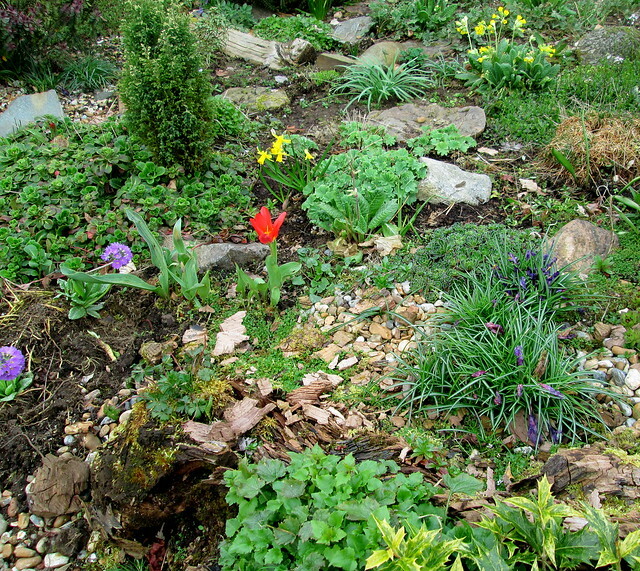 Your rockery is filling in so quickly! Those primulas seem to seed very easily and some of the seedlings are coming up pure white, very pretty. I think that although the garden is hard work it helps to keep me fit – and happy! Your garden is looking lovely! Yes, those are red admirals, we have them in Minnesota too though it is still a little early for them yet here. There have been loads of bees out though and ants, gah, ants all over the place! We finally managed to convince them that outside was better than inside. Don’t mention ants! I can hardly write the word, I’m quite phobic about them after being inundated with them at our old house from time to time. Honestly to me the only thing that looks more terrifying and evil are the nuclear submarines that are berthed a few miles from where I grew up! I wonder if the butterflies are the Small Tortoiseshell variety? If they have overwintered nearby they will be very glad of your heather blooms. The cherry is making a brave show for a young tree! Thanks, I think you’re right about that, the red admiral is a lot darker. We don’t get an awful lot of different butterflies here. I think these ones will have overwintered in the woodland behind our house. They hatch out from the long grasses too as I discovered when I dried some grasses upside down in the house.